Mine go up to 11. It doesn’t show it at 11, Biff wouldn’t have a head if he pumped it that high. DRAW LOUDER PLEASE, ME CANT READ IT PROPERLY! the “mine go up to 11” line was a This Is Spinal Tap refrence. No, it really is a Spinal Tap reference. Guitar Hero 1 also took the reference – on their loading screens, each knob goes to eleven. amplifier. There’s a slight possibility for overload. Nigel Tufnel: This is a top to a, you know, what we use on stage, but it’s very special because if you can see . . .
Marty DiBergi: Yeah . . .
Nigel: . . .the numbers all go to eleven. Look . . . right across the board. Marty: Why don’t you just make ten louder and make ten be the top . . . number . . . and make that a little louder?. . .
Nigel: . . . 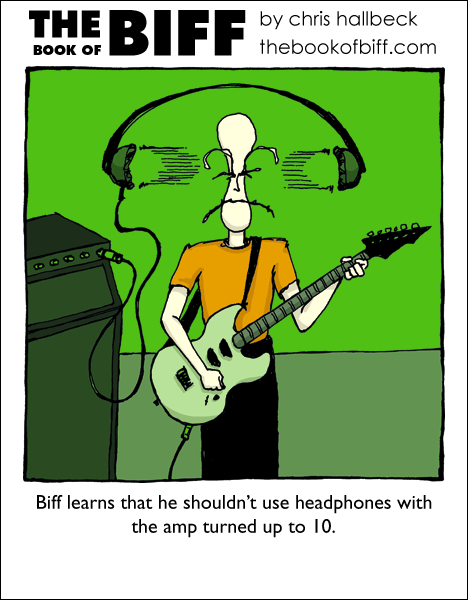 These go to eleven. Card game munchkins? How do you know my friends? I actually remember watching footage of eardrum repairment when I was 8. It’s very dark inside the ear. My ears are still ringing from when my stereo was set to max volume by mistake, with super sound, and that was 2 days ago! It’s even kinda loud when it’s just three things above mute, super sound off. I know exactly how he feels. I’ve done that with my guitar a thousand times, cos we have to share amps at school. I adjust the knobs on the amp and turn up the ones on the guitar all the way. I guess they do the opposite. But omg, does it hurt. Sharing amps and stuff sux rocks. But really, whats the point of turning DOWN the guitar knobs? it just hampers the signal path and creates more noise. Those are some big headphones. Mine has all of yours beat. It has actually broken glass. It goes up 2 50. It hurts alot. Specially since I play on an old Gibson. They are loud as is. At least imploding Biff’s head made his eyebrows a little longer. I’ve finally watched Spinal Tap. It was funny. But i`m wearing headphones right now…. Mine goes one higher than yours does. Mine go up to NINE THOUSAND. …Damn you, Spinal Tap, for starting a war for higher numbers.